Your pool must be protected from germs, bacteria, algae and a variety of other organics. Without reservation, chlorine is simply the best sanitizer for your outdoor pool. There are other sanitizers available but, in one way or another, they all fall short of chlorine. 1. 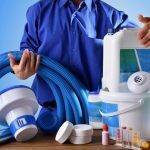 Liquid chlorine – Household bleach and liquid pool chlorine are the two common sources. They are identical in every aspect except strength, household bleach is typically 8.25% and pool chlorine is usually around 12%. The huge advantage of liquid chlorine is that it introduces nothing into your pool except chlorine and a small amount of salt. It’s almost the perfect chlorinator except for one thing…it’s very bulky and, as a result, the handling of it is a nuisance compared to other forms. 2. Trichlor – Commonly sold as tablets or pucks that you simply put into an automatic container that passes pool water over them and they slowly dissolve – putting chlorine and CYA into your water and lowers the pH. They are incredibly convenient and incredibly insidious. The CYA that they put into your pool water doesn’t get used up, and instead accumulates. Eventually the CYA level will build up to a point that renders your chlorine ineffective. Typically, everything is fine, until one day you start to develop algae and don’t understand why. 3. Calcium Hypo – A convenient, usually powdered, form of chlorine. It’s big advantage, like trichlor pucks, is it’s convenience. Long term, that convenience makes you pay a price. Roughly 1/3 of Cal-hypo is Calcium that, again, goes into your pool water and you can’t get it out. Constant use of cal-hypo usually results in the calcium level getting way too high in your pool which can cause scaling or cloudiness. 4. Dichlor – A stabilized, granular, fast-dissolving form of chlorine. Because it dissolves so easily, it is often sold as “shock”. Like trichlor, dichlor adds chlorine and CYA to your water and lowers the pH. Use of dichlor can raise your CYA level very quickly. 5. Lithium Hypo – A convenient powdered form of chlorine. Like liquid chlorine it doesn’t add anything that will cause problems to the water. However, it is generally far more expensive than any other form of chlorine. 6. SWGs (salt water chlorine generators) – Installed in your circulatory system and electrically powered, SWGs produce chlorine from the salt that you have added to your pool. A different article, Salt Water Chlorine Generators, covers them more thoroughly. Briefly, ease of use is by far their single best feature. The large initial investment to purchase the system is their big drawback. Synopsis: Liquid chlorine (bleach) or an SWG are your two best options. Both will keep your water sparkling all summer with little, if any side effects.